Many evaluations include a process of developing logic models and theories of change – an explanation of how the activities of a program, project, policy, network or event are expected to contribute to particular results in the short-term and longer-term. They have been used for many years – versions can be seen in Carol Weiss’ 1972 book “Evaluation research: methods for assessing program effectiveness” – and they have been mainstreamed in many organisations as an essential component of planning and evaluation under various labels, including program theory, programme theory, intervention logic, investment logic, outcomes hierarchy. However, their full potential is often not met, as many people seem to think that the basic version they know is all there is, even when it doesn’t really meet their needs. BetterEvaluation.org have grouped resources together under some of the common challenge areas people have with theory of change: explore them on this page. 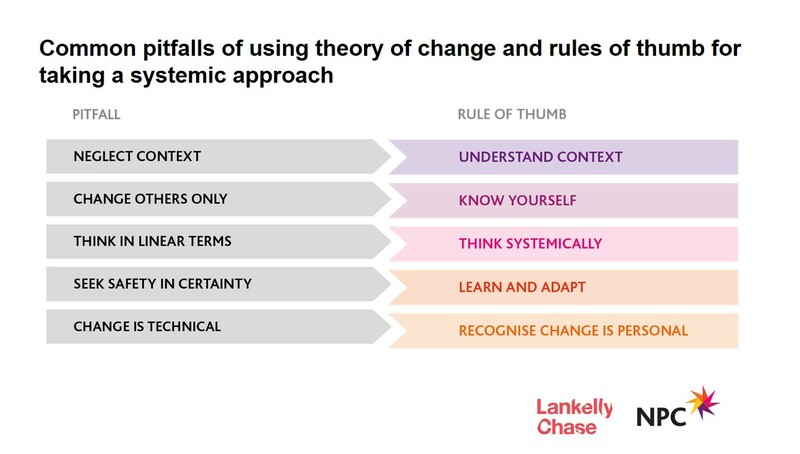 This report by NPC and Lankelly Chase identifies five common pitfalls that organisations fall into when using theory of change, and walks through five rules of thumb that will help organisations to use the approach to tackle complex problems. Access it here. Make sure you also check out the related resources on systems change and theory of change.